Saturday the Chief Actuary of Medicare & Medicaid, Rick Foster, released his estimate of the effects of the House-passed health care reform bill. His memo shows how H.R. 3962 would affect the number of people with different types of health insurance in the year 2019. 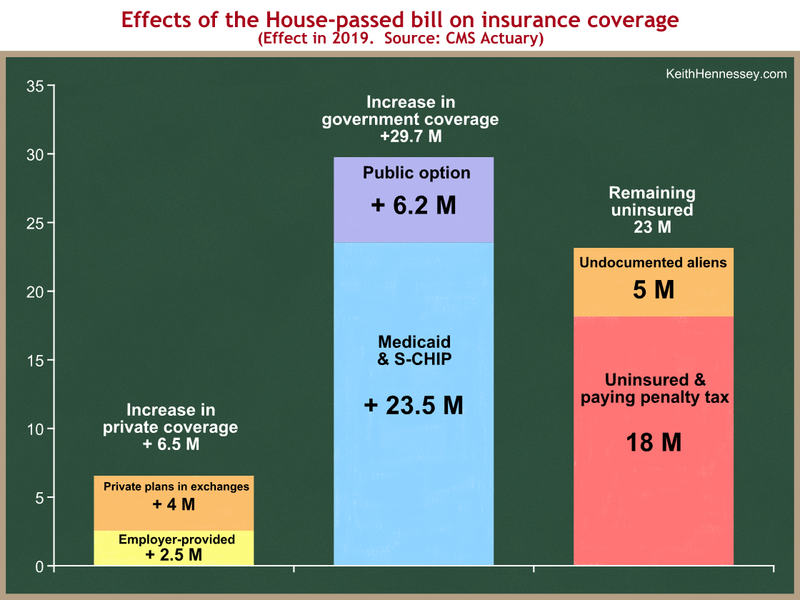 I made a picture of the most interesting effects, grouping the newly covered people into private coverage vs. government coverage. As always, you can click on the graph for a larger version. These 18 M people relatively healthy people would remain uninsured and would pay a tax that is equal to the lesser of 2.5% of their income (a version of modified AGI) or the average health insurance premium. Source: All data are from the 2019 column of Table 2 of Foster’s memo. The +4 M is the net of +18.6 M who would enroll in a private plan through an exchange, minus 14.6 M who would no longer fall in the “other private insurance” category, almost all of whom are people who today buy their insurance on the individual market.